MARTINSVILLE—Father John Hall is the pastor of St. Martin of Tours Parish in Martinsville, and the administrator of Our Lady of the Springs Parish in French Lick and Our Lord Jesus Christ the King Parish in Paoli, all located in the Bloomington Deanery. He was ordained in 1980 and is 56. Born in Beech Grove, Father Hall grew up a member of Our Lady of the Greenwood Parish in Greenwood. Meeting priests—Father Hall’s priestly vocation was nurtured at Our Lady of the Greenwood Parish and at St. John the Evangelist Parish in Indianapolis, where he had relatives who were members. As he grew up in the 1950s and 1960s, both parishes had many priests serving as associate pastors or in residence there. Becoming a seminarian—This observation of several diocesan priests led Father Hall to become a high school seminarian in 1968 at the former Latin School of Indianapolis. That was a time of great change in the Church, especially in the liturgy. Msgr. Charles Koster—Msgr. Charles Koster was perhaps the most influential priest for Father Hall. 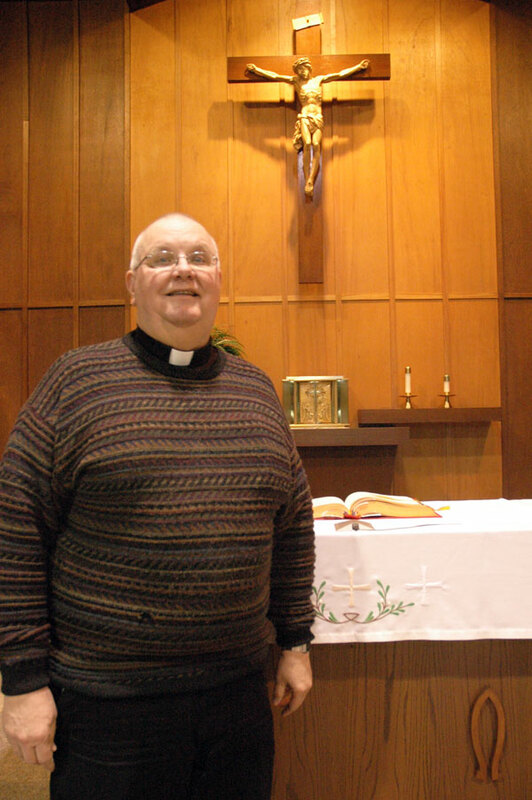 He was pastor of St. John Parish when he was a seminarian, and hired him as a janitor for the parish during his summer breaks from Saint Meinrad College in the 1970s. “He allowed me to work there,” Father Hall said. “And when he was teaching at Saint Meinrad in my college days, he would take me out for supper. Putting out fires—It was in getting to know Father James Wilmoth, who was an associate pastor of Our Lady of the Greenwood Parish during his youth, that Father Hall gained an interest in firefighting. Father Wilmoth was a chaplain for the Indianapolis Fire Department at the time. As a high school seminarian, Father Hall became involved in a Boy Scouts Explorer post run by the Indianapolis Fire Department in which he received some basic firefighting training. As a college seminarian at the former Saint Meinrad College in St. Meinrad, Father Hall served on the local volunteer fire department there. He served as a firefighter, first responder and chaplain for a volunteer fire department while serving as the resident pastor of the parishes in French Lick and Paoli from 1989 until 2001. Father Hall doesn’t fight fires anymore—“Not at 56 years old!”—but he serves as the chaplain for the Martinsville fire and police departments. Ministry of presence—Being a chaplain for emergency personnel is just one part of what Father Hall sees as his ministry of simply being present among the people of his parishes and the broader community. For most of his priestly life, Father Hall has served at small parishes in the countryside or in small towns that make such a ministry more easily possible. But wherever he is ministering, Father Hall feels most like a priest when he is simply present to people. Advice for those discerning a priestly vocation—“Be open to it,” Father Hall said. “Pray about it. It is a good life. Yes, there are demands. But there is a lot of goodness in it.